In February, 2018, my photographer friend and BOMH Juried Member Kim Carr, visited my studio for a short tour. 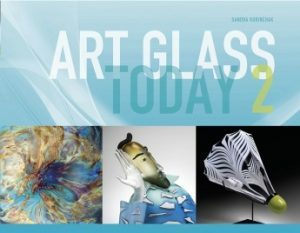 Schiffer Publishing has released its Glass Art Today 2 book. Pages 100-101 feature my Jazz Seasons panels and two of my dichroic plates. What an honor! 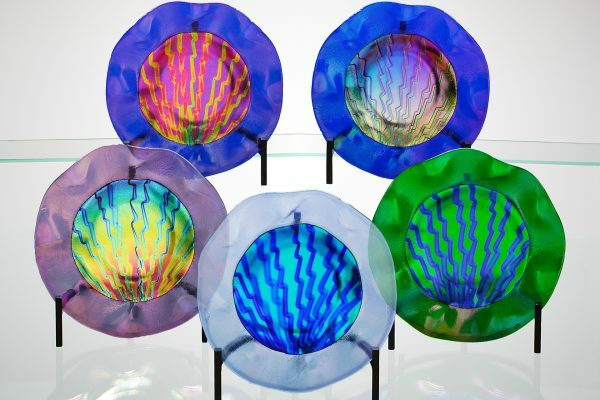 In January 2014, the Missouri Arts Council published an article "Meet the Artists Who've Made the Glass for the Missouri Arts Awards". The article spoke of the award artists over the last decade or so. The article was later picked up by The Missouri Dept. of Tourism which published it in their Visit Mo Spotlight. The Missouri Dept. of Economic Development also reprinted the article in their weekly e-newsletter, Missouri Focus. During the last quarter of a century or so, Peggy King has made a career of serving first as the Office Manager, and now Energy Analyst for a state association. The work requires logic, an analytical mind, a head for detail and the constant crunching of numbers. Although the work is certainly rewarding, there is little outlet for creativity, as that type of thing is highly frowned upon in the world of bookkeeping. An affirmed non-artist, Peggy “found” glass at the age of 50. It was like receiving a surprise gift for some forgotten occasion. She hadn’t planned on becoming a glass artist. She took a bead making course on a whim. Then she took a fusing class, and was hooked. 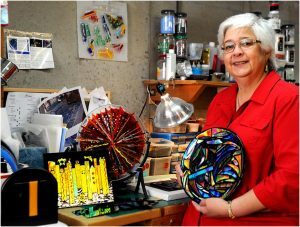 In her home studio in Columbia, Missouri, she now creates both lampworked (hot) and fused (warm) glass art. The backbone of her stock in trade consists of a room full of glass in five different varieties and a multitude of formats. Each must be kept separate because they don’t play well together! Each of Peggy’s fused glass plates is created individually. Most sport dichroic color and/or irridized glass. Many of her designs are of a geometric nature, possibly reflecting her experience with patchwork quilting – or, as she says, it is just an extension of her analytical mind. Her “fishies” kiln-fused underwater scenes are lovingly made piece by piece including lampworked details representing sea plants and other creatures. She has also “dabbled” with learning to blow glass. She has already made her first obligatory paper weights during an eight-hour, intensive glass blowing class. Because there isn’t a hot shop for miles around, she will just have to pursue this form of glassmaking as she gets the opportunity. The ability to use heat to create beautiful works of glass art, from a tiny bead to more functional glass-ware items, is ancient. It’s been around for a couple thousand years. Peggy says that there are so many ideas in her head and products or techniques on her list of “things to try”, that she knows she will never exhaust the possibilities. For half a century, she lived with no appreciation for the beauty of glass and its amazing, sometimes flabbergasting properties. Having long considered herself to have no artistic talent, Peggy was unprepared for the journey that “glass” was about to become. It has opened her life to the arts, to new friends, and, finally, a way to express her creativity through a medium that is fluid, surprising, and amazingly beautiful. Her reward is always the greatest when a person touches or looks at a piece created by her and smiles. That simple smile means that her art touched that person somewhere – probably unexpectedly. Which, says Peggy, brings her full circle to how her addiction to glass began in the first place. 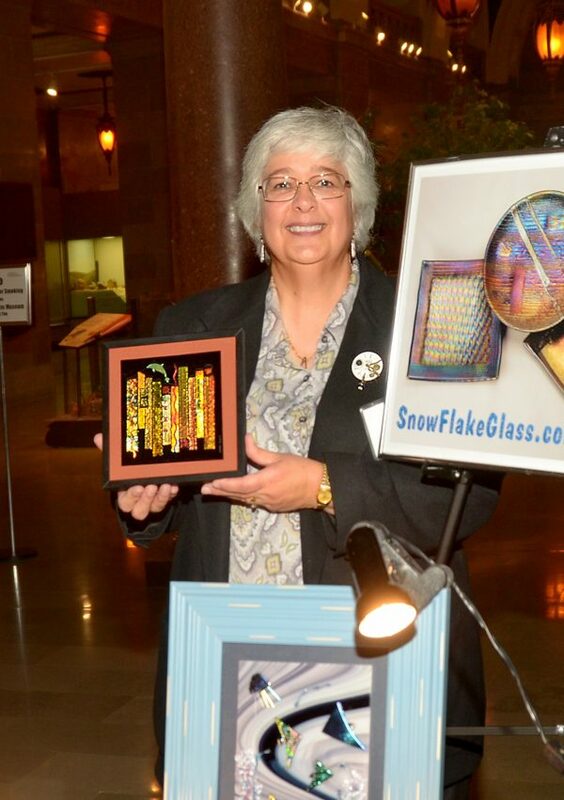 Peggy King of Snow Flake Glass in Columbia, Missouri has been elected 2010 President of the Missouri Artisans Association, better known as The Best of Missouri Hands. The Best of Missouri Hands is a statewide, 501c3 nonprofit organization of over 450 members, dedicated to the development and recognition of Missouri artists and artisans through education, interaction and encouragement. Members strive to educate as well as to raise public awareness and interest in Missouri’s handmade arts and fine crafts. In March of each year, the organization presents ArtSmart, a three-day conference open to the public, with nationally-known speakers and programs of interest to artists of all levels. The conference will be held in Boonville this year. Information about the organization is available through its website (www.bestofmissourihands.org). Although Peggy King is a full-time energy analyst by day, her attention to detail carries over into something magical after-hours. In the basement of her house is a studio she has formatted to suit her passion, taking it over from her husband, Bob, a clockmaker. Now it is her haven for glassmaking. The Best of Missouri Hands juried artist — she is also a past president of the organization — has created and sold her glass artworks for several years at Bluestem Missouri Crafts, the Columbia Art League and Art in the Park along with exhibiting at shows in St. Louis. 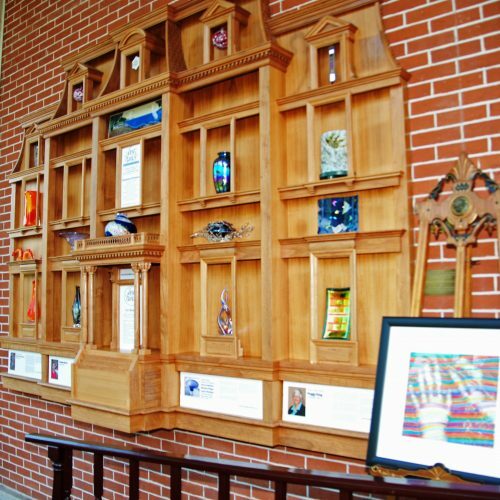 Most recently, she was given the opportunity to create for this year's installment of the Missouri Arts Awards, given by the Missouri Arts Council. 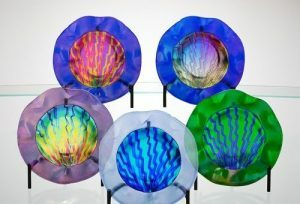 King created vividly colored platters with two types of colored glass — iridized glass and dichroic glass, which has to fuse at a certain rate of cooling so it does not eventually pull apart and break days, months or even years later. In her studio, King turned on the flame of a dual fuel torch, powered by a propane tank and a refurbished oxygen concentrator similar to those used in hospitals. She began melting a thin rod of glass over a separate stainless steel rod called a mandrel, waving the glass rod through the flame until it began to soften. The glass eventually wrapped itself around the mandrel as she turned it, a taffylike curling that eventually settled into a more spherical shape. "I started by taking a bead-making class, and I was immediately drawn to the flame," King recalled. 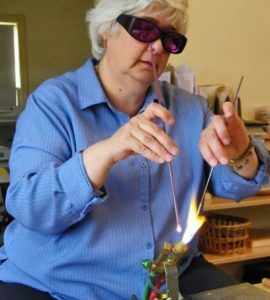 After that adult-education class through Village Glass Works, she bought the torch and began practicing straightaway. Although the bead-making — lampwork, as it is known — was initially satisfying, "I didn't feel like I had the control over the work that I wanted," she said. "So I went right back, and I took my fusing class and bought my kiln the same day." Now King works primarily with fusing glass. 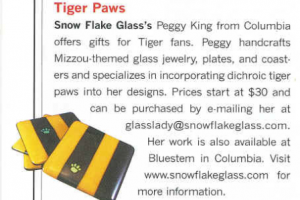 Her University of Missouri Tiger Paw stylized glass coasters sell out consistently at Bluestem, and she is working on bookends and gift boxes with the same fat-striped gold-and-black design. She also makes glass jewelry — earrings, bracelets, , pendants — smooth entities enclosing a spectrum of textures and colors. She recently began experimenting with dichroic glass that has detailed patterns overlaid on the sheets; she cuts strips of glass and fuses them together on thicker frames. Her work is often bright and colorful while still containing a kind of pleasing order in her mind, she said. "I'm very linear. I'm an analyst by day," she reiterated. "So when I look at something like this," pointing to a plate containing crazily colored squiggles that she had created as an experiment, it reminds her of a crazy-looking "ugly amoeba." Typically, she said, "I want things more linear, lined, straight, organized." King has worked with several types of glass — her studio is abundant in rods and materials for King has worked with several types of glass — her studio is abundant in rods and materials for beads, molds for plates and other dishware, cut glass for fusing work and gritty ground glass called "frit" for adding texture and color to already molten glass. The current glass movement explosion in the United States traces its roots to the late 1950s, King said, when enterprising artists began to experiment with heating, forming and shaping. "Glass has always been the provenance of Italy, and they have always been very jealous of their methods," King explained. "So for years and years and years, they were the only ones who knew how to make glass." So it was American hippies and their slightly earlier predecessors, King said, who had to start over from scratch and learn everything themselves. They built small furnaces and learned how to mix artistic glass instead of using machine-manufactured glass used at that time for cookware and bottles. Now, in the United States, methods and materials and instructions are shared freely. King is a direct beneficiary of those who experimented with glass over the past half-century because now it is a cinch to order the types of glass she wants to work with. When she receives dichroic glass in the mail, for instance, it already has different colors and patterns applied to it in a high-tech process using vacuum chambers and ion guns. For the Arts Awards, she used voltage-pattern dichroic glass, which takes on the appearance of colored lightning bolts careening from the corner of a glass quarter sheet. King is glad of the vibrant range of colors and glass materials at her disposal. "I don't want to make glass. I want to melt it," she said. Instead of creating it herself, she wants to re-create it in her art. She still feels strange thinking about herself as an artist; she could never draw or paint growing up, she said. "But I do have an eye for color and pattern." She did patchwork quilting before she took up glassmaking, and there is something about putting the squares together that lends itself to setting up the patterns and structure of her glassworks, she said. King constantly researches ideas on the Internet, devouring concepts from other glassmakers in the region and experimenting; often she says she has not yet perfected this or that technique. But her love for exploring within the medium is evident to anyone who might enter her studio. "It's my release from the black and white that I work with every day, the numbers," she said, picking up a small rectangle of patterned, sea-blue glass. "Look what I get to play with. How happy is that stuff?" 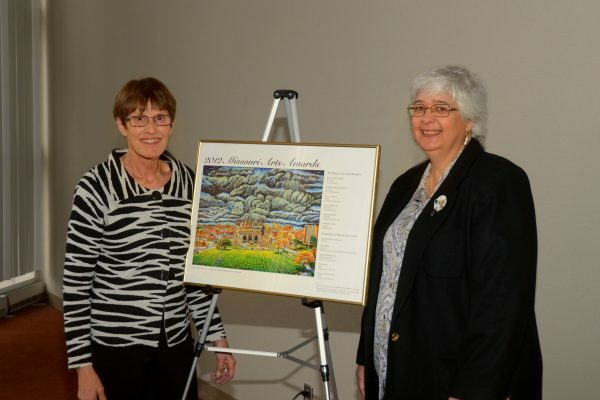 Peggy King, energy analyst at MPUA, has been elected 2010 President of Best of Missouri Hands, an organization dedicated to the development and recognition of Missouri artists and artisans. Perhaps you are wondering how an energy analyst qualifies as an artist. Well, there is so much more to Peggy than just an analytical mind. Peggy's career at MPUA began in 1986 when MJMEUC was fairly new. Bob Barnett hired her as secretary-bookkeeper. She was promoted to office manager and now holds the position of energy analyst. Her art career began five years. ago when she took a lampworking class on a whim. According to Peggy, she discovered an artistic side she never knew existed. As her skill and creativity as a glass artist developed, she became involved in the Columbia Art League and Best of Missouri Hands. Soon she was attending workshops to learn more skills and participating in art shows to showcase her creations. After Peggy spends a long day crunching numbers, analyzing statistics and seeing .everything in black and white, she heads home to a workshop where a world of beautiful, fluid, colorful glass awaits her. 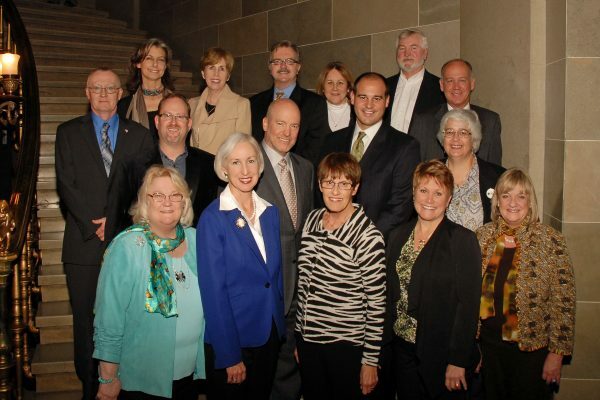 When elected as the 2010 President of Best of Missouri Hands, Peggy attributed the skills and knowledge required for the position to her years at MPUA. "Working here has taught me to recognize what needs to get done by a state-wide association Board of Directors and how to go about accomplishing it," said Peggy. Just as she has spent the last 25 years working for the good of the membership of MPUA, her new leadership role with Best of Missouri Hands requires the same kind of dedication, working for the best outcome for the group. Peggy assured me that her glass art is, and will remain a. hobby ­ and that she'll continue to serve the members of MPUA for some time to come. For more information on Best of Missouri Hands and to view Peggy's art work, visit www.bestofmissourihands.org. In the fall of 2011, I was notified by the Missouri Arts Council that I was to be commissioned to make the awards which would be presented to the 2012 MAC Award winners in February, 2012. This has been the highest honor I have ever received. I'm still trying to deal with the idea of actually being an artist. And here I was being recognized by THE state organization for the Arts, and being asked to make awards for 5 of the most prestigious honors in the Missouri Art Community. 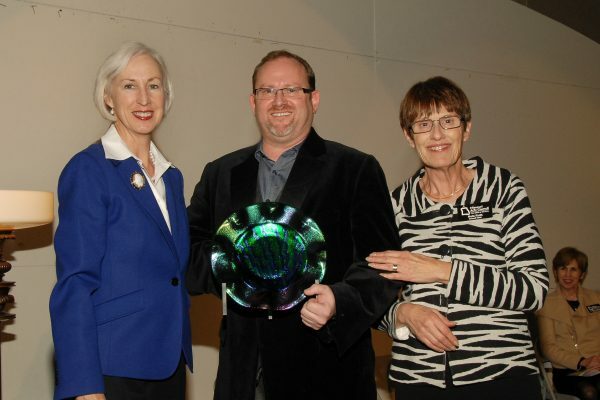 Here are the photographs of the five dichroic and irridized glass plates I designed for the event. The exceptional photography was done by the amazing Don Casper of St. Louis Missouri. COLUMBIA — Peggy King prefers to use her basement as her artist's studio. She spends most evenings preceding art shows down there, playing with a 2,000-degree dual fuel torch and shaping molten glass. Her two kilns are always plugged in, ready to fire. 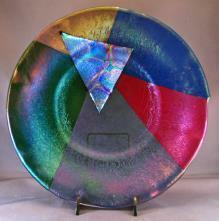 King works with glass; she makes plates, coaster, lamps, beads, jewelry and Christmas ornaments. Although she loves what she does, she is quick to praise other people's work, and she has some of the work in her house. At the Fall into Art festival this weekend, King is displaying plates, business card holders, coasters and her popular “Fishies” series of underwater scene glass panels, among others. Five years ago, King took a class on glass fusing at Village Glass Works. The same day, she bought a kiln and, as she put it, went crazy. King works with numbers every day as an energy analyst for Missouri Public Utility Alliance, but she uses glass work as her creative outlet. She is also the president of The Best of Missouri Hands, which represents Missouri artists of all skill levels. Born and raised in St. Louis, King is one of six children, four of whom are doing something with numbers or engineering. She shares her home with her husband, Bob, who owns and runs Pendulum Bob’s Clock Shop in Columbia, and their 14-year-old cat, aptly named "Kamere." When they got her as a kitten, that was what she responded to. She attends a bead-making retreat for four days in May where she gathers with a bunch of artists. They set up tables and spend the day making glass beads. "I say, 'It's nice of you guys to let me hang out. I drool on my torch, you know,'" she said. “There’s just something about glass artists. There’s no competition,” King said. Blue Stem Missouri Crafts carries her jewelry year-round. Around Christmas, they sell King’s handmade ornaments. King’s newest work is a line of glass lamps, and she said she is anxious to see how they sell at the show. Everything she sells at the show will be $100 or less. 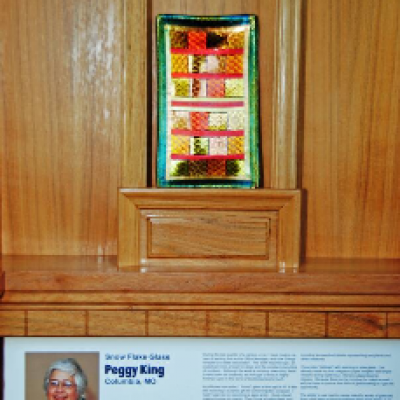 Peggy King, along with three other BOMH Juried Artists recently had their work installed in a huge walnut cabinet in the Missouri Governor's Mansion, commissioned by then-Governor Holden. The cabinet replicated the shape of the Governor’s Mansion itself and was installed in 2005 on the enclosed “back porch” of the Mansion. First Lady Georganne Nixon and her staff, along with a BOMH committee developed the idea of a rotating display of BOMH work to keep the display fresh and focused on Missouri’s artists. The plan is to rotate the work, by mediums, on a regular basis (at least twice a year). The first exhibit features glass; the medium and featured artists were selected by Mrs. Nixon’s staff from the BOMH website. Artists were asked to create special pieces to fit within the space limitations of the cabinet. The display includes artists’ bios and hometowns, a photo and website of each artist, and information about the MAA/BOMH. 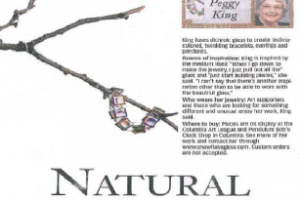 COLUMBIA — Local glass artist Peggy King found her passion at the age of 50. Searching for something more creative to occupy herself outside the office, King stumbled upon a lampworking class. She knew immediately she had found something special. 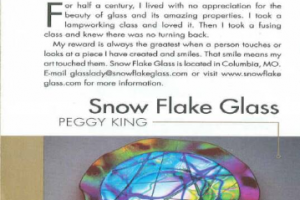 King now has her own line called Snow Flake Glass. She will be selling her creations this weekend at the King's Daughter Holiday Festival at the Holiday Inn, 2200 I-70 Drive S.W. She is also bringing some of her black-and-gold Tiger Pause line. Internet sites such as Lampwork Etc. provide King with fused-glass techniques and the ability for her to do group purchases for cheaper supplies. She now owns two kilns in her basement studio. “There aren’t too many people that understand the complexities of fused glass,” said Jane Domke, a friend from the art glass community. The artists meet once a month, alternating their homes for an informal glassworks club. King sells her work at her husband Bob's store, Pendulum Bob’s Clock Shop in Forum Shopping Center, as well as at Bluestem Missouri Crafts and the Columbia Art League. She also takes part in art shows, such as Columbia Art League's “Art in the Park,” the Arrow Rock Heritage Craft Festival and Affair of the Arts.